The picture below shows a list of the tonic triads for each of the twelve major keys. A tonic triad is a chord made up of the first, third and fifth degree of the scale. For example the scale of C major is C, D, E, F, G, A B, C. The first degree (or first note) of the scale is C, the third is E, and the fifth is G. Each chord shown below is in root position. This means that the first degree of the scale is in the bass (the lowest note). The notes of each chord can be rearranged (inverted) and played at different octaves for different musical effects. The chords beginning on black keys can also be named by their enharmonic equivalents. In other words: D flat major can also be called C sharp major, F sharp major can be called G flat major etc. However, in the picture I have named the chords by their most common and logical enharmonic equivalent name. E.g. 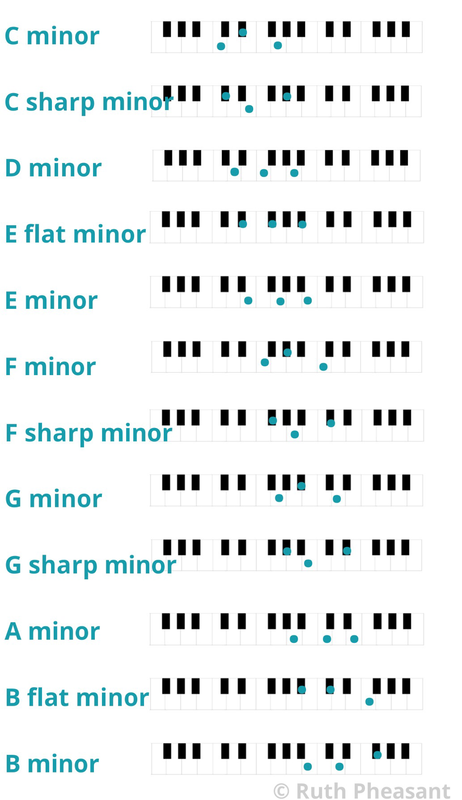 it is more logical to say “D flat major” instead of “C sharp major” because the note names of the scale of D flat major are simpler to work out than those of the scale of C sharp major, even though the pitches are the same. Read more about chords here: Chords, Roman numerals and inversions.